This 2013 set of Study Group Readings is available as MP3's or as an e-transcript. Quite a few people have submitted questions about the shooting that took place at the Sandy Hook Elementary School in Connecticut in December. Our first three questions address the most common themes in all of the questions sent in. 1. This question is from Virginia, and the questioner writes: "We were all so saddened to learn of the Sandy Hook massacre, which took the lives of so many innocent young children. I could feel the hearts of so many people opening through their pain and reaching out with love to others. I believe there is a shifting awareness of what is really important, especially at this time of year that is so filled with commercialism. Would you please discuss the soul intent of the individuals involved in the Sandy Hook school massacre which killed so many innocents? Does this even have a larger purpose in our souls' progression and evolution on earth as we move into higher frequencies? Does an event like this actually help people to evolve more quickly? Help us to understand the larger purpose and good that comes from an event like this." 2. This question is from Nevada: "There is something almost presumptuous about thinking that my voice could make any change or difference, but there is nothing at all presumptuous about ten-million voices, raised in common outrage about the massacre, to give energy to reform initiatives. But, here is my question for the Guides. Can the parents hear and find some comfort in our concern and our prayers?"3. This question is from California: "The tragedy at Sandy Hook School raises questions about prevention for the future. Clearly, it's not just about armed guards at schools, or even gun control. Given the complexity of our society, what are our most effective leverage points for positive change for individuals, communities, and political structures?" 4. And now to change the subject. This question is from Vermont: "What is the relationship between doing attunements and living a life of creativity and passion? How do attunements support our ability to manifest results, make wise choices, take risks, cope with negativity, and so forth? Are attunements just a totally separate focus for us?" 5. This question is from New York: "Are there human truths revealed to us upon our death? Do we gain any different understanding of our life? Do we become aware of where we either healed or created negativity?" 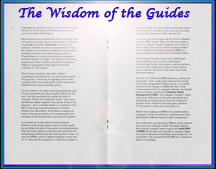 The Guides went directly into the closing attunement from the answer to Question 5. 1. Our first question is from California, and the questioner writes: "Current medical wisdom says that inflammation is a major cause of illness, including cancer. Will you discuss this? How can we best reduce inflammation before it causes illness?" 2. This question is from Maryland: "In a previous study group response to a question regarding trying to change bad habits, you said that it is very difficult to stop smoking or lose weight because the impetus for the choice to do so comes from negative emotions. For example, 'I am too fat, I should not smoke,' etc. etc. How, then, can we change those negative emotions regarding ourselves, in order to make positive changes? Where else would we get the drive and motivation to make changes? 3. This question is from New York: "Many of us love eating crustaceans such as crab and lobster. But, I've long been troubled about the way they are cooked-thrown in a pot of boiling water, or brought to a boil, while they are still alive. Many people believe lobsters and crabs feel pain when cooked in this way. Do they? Beyond this specific question, more generally, is there a way to slaughter animals and fish for eating in a more humane way? Are there nuances in this? Or does eating all seafood and meat consist of making creatures suffer, and if so, how can conscious people balance their love for such foods with their desire to limit suffering?" 4. This question is from Florida: "Some of the major religions teach that groupings of people are being either punished or rewarded because of how they follow a 'commandment code system' supposedly given by God. This has caused war on the earth, and has led people to refuse to see the oneness of each soul connected to the infinite Divine. They continue to insist that their god is the 'real' god, and their values are the true rules for life. What can we do about this?" 5. We have two questions from participants in the Retreat with the Guides last November and we think they will be of interest to everyone. The first question is from California: "The Retreat was about personal healing, and there was an abundance of spiritual love, light, and releasing that took place during the course of the week. After the retreat, a number of people experienced different kinds of illness upon returning home. We are wondering what the connection is between an intense spiritual awakening, or releasing, and physical illness. It seems that sometimes physical illness can trigger spiritual growth and awakening. Can awakening also trigger a physical releasing, resulting in illness in the body?" 6. The second Retreat question is from Minnesota: "During the Retreat, there was a magnificent 'sacred space' created for people to interact with each other in a healing manner. Love emerged consistently and spontaneously. How do we create and hold that sacred space in everyday interactions, especially with those we are around a lot-those we love and tend to take for granted?" 7. This question is from Texas: "You have said that Jesus taught that death is not an end to the soul's experience, but that each of us have died many times in the past and will have many lives in the future. The teachings about spiritual life after death of the body have survived, but the concept of many lifetimes in many human bodies has not survived in the Christianity teachings that have been passed down. Why did the teaching about multiple lives not get passed down with the other Christ teachings?" 5. This is my question [Susan]: Ron and I are enjoying reading a book called, Proof of Heaven, by Dr. Eben Alexander, a neurosurgeon who had a remarkable Near Death Experience. In his book, he describes how he entered the Divine realm and learned profound truths from God. He sums up those truths in these three statements: “You are loved and cherished, dearly, forever. You have nothing to fear. There is nothing you can do wrong.” In the Study Group Readings you have often spoken in this way. Would you tell us about the spiritual truths behind these three statements? 3. The following is my question [Susan]: I recently read two books about near-death experiences. One was Proof of Heaven, by Dr. Eben Alexander, and the other was Dying To Be Me, by Anita Moorjani. Alexander’s near-death experience was quite different from Moorjani’s in the beginning, even though they came to the same spiritual conclusions in the end. This made me wonder, how much does the individual’s personal belief system affect a near-death or out-of-body experience? 6. [Susan]: The increased frequency of near-death experiences is a product of modern medicine being able to bring people back to life. It seems like an important by-product of science that can inspire people and remind them of their eternal nature. Because of the kind of mass reporting of fear and chaos in the world, it seems like a very important time in our evolution for this to be happening. Would you comment on this? 1. Our first question is from Washington State: "My question is about future lifetimes. If we do our best in this life to heal our fears, to love ourselves, to love others, and to walk our life path knowing that the force of God is within us, will we start over in our next life or continue where we left off? From past Readings, it seems there has been a mixture of success and failure in our previous lives, which causes me to wonder if each life is a new game, possibly with subtle but unconscious threads from previous lives." 2. Our second question is from California: "There is a quote in the bible, John 14:6, where Jesus says, 'I am the way and the truth and the life. No one comes to the Father except through me.' This passage has been used by many Christians to say that you must believe in Jesus in order to know God, or to go to Heaven. What would you say is the highest meaning of this statement?" 3. This question is from Oregon: "I am a practitioner of the Reiki healing technique. I know that when I tap into this energy I can feel shifting and openings occur for myself, and I witness the shifting and openings in my clients. When I practice Reiki on myself I feel more grounded, and magical things start to happen in my life. Would you explain more about Reiki to me, what is it, how am I tapping into it, was this the energy that Jesus used when he helped to heal people?" 4. This question is from Texas: "As we were sitting with my father in the final days before his death, we were unable to control the pain for his physical body, which was difficult for all of us. However, it seemed like he had pulled out of his body somewhat and I wondered if this was a coping strategy to limit his perception of pain. For so many people uncontrolled pain at the end of life is the scariest part of dying. Would you speak to what the perceptions of a dying person may be as they are enduring the final stages of a painful disease like cancer? How can we feel the truth that pain is not badness when we are with a loved one in that situation?" 5. This question is from California: "Does everyone who enters human life come in with a promise to make a contribution?" 6. This question is from Vermont: "I am taking a course taught by a teacher whose life purpose is to help people realize their true dream. I am feeling a bit uneasy because after three weeks I haven't identified my dream. That is, I do not feel passionate about one thing that I really want to do, or one outcome that I really want to achieve. Are we all supposed to have dreams, and passions, or heartfelt desires? What if we do not have passions? How are we to encourage them to appear or to bring them to the surface of our consciousness? Or, is it natural just to not have passions and to just 'do' life, so to speak. Would you please guide us here?" 1. Our first question is from Minnesota: "When we see a loved one, such as our adult child, making choices that are clearly going to lead to painful consequences for them, or that will hurt someone else, how do we let go and still love them?" 2. This question is from Arizona: "It is difficult to feel our inner goodness when we have done things that we are not proud of and feel bad about. How can we truly feel our goodness in this circumstance? Are there cases where we must just live with feelings of guilt or badness and accept occasional glimpses of goodness?" 3. This question is from California: "From your perspective, what is going with the person who is diagnosed as a sociopath? Why would the soul allow such a profound disconnect and de-valuing of others? Is this condition curable?" 4. This is my question [Susan]: "I recently had my DNA analyzed through ancestry.com. I was interested that I do not have one scintilla of Asian, African, or Indian (east or west) DNA, although I feel that I have had past lives in those places. I am wondering if our DNA, or ancestry in this lifetime, has anything to do with past lifetimes. Would I, for example, have had more Caucasian lifetimes than Asian or African? Does current DNA have anything at all to do with human past lifetimes?" 5. This question is from Oregon: "Would you help us to better understand why it is that the more advanced humans stop reincarnating into earth, often becoming guiding souls to living humans? Wouldn't the spiritual advancement of the human race be accelerated if the more spiritually advanced humans would stay in the earth lifetime after lifetime, teaching and showing by their lives how we are meant to live and grow in kindness, love, compassion, and patience?" 6. This question is also from California: "I just had a personal Reading with Ron, and when he came out the Reading he told me that he perceived that the human experience of passing through the "near-death tunnel" to the light can be achieved through attunement, but he was also aware that this state is hard to achieve in light of the intensity of our normal experience of daily reality. I am curious to know what you would say about this." 4. Follow-up: And then would you address the part about the soul not entering the child’s body until after the baby is actually born? 6. And another question along these lines. Are you, the Guides, still involved in growth and learning and expansion yourselves? Or is your development done? 7. Would you please close with an attunement for us to use this coming month? 2. Question 1 Follow-Up, Susan: When you say the more fear in the person, can it also be the belief system? I mean, maybe it’s not about fear for Eben Alexander, but his belief in science and just the physicality. I don’t believe he believed in an afterlife before he had this experience. So, would that have caused him to have what the questioner says is a hellish experience, that sort of wormlike experience in his own brain? Is that part of what caused that? 3. This is my question [Susan]: Since the popularity of Dr. Eben Alexander’s book, the use of sound waves to promote out-of-body experiences has come to our attention. He promotes that actually though the Monroe Institute. In fact, I tried meditating to sound waves and had a weird experience that I recognize as being slightly disconnected from my body, but not totally out of my body. It actually wasn’t very pleasant. I’m wondering if we were really meant to force out-of-body experiences. Should one persist in this kind of practice in order to have an actual out-of-body experience? Or, perhaps it should only be used in a monitored, or more clinical situation. 8. Would you please close with an attunement for us to use in the coming month? For the September Reading, I am presenting the first of 4 Readings that were given live at a 2-day workshop in the year 2000 called “The Path of Service.” This first Reading was the opening Reading that set the stage for the wisdom that would be given us by The Guides on the subject area of “Service.” The music at the beginning is Plateau of Mirrors by Brian Eno. We have used this piece at our Retreats and Workshops for 30 years to help us enter into the sacred space that the Guides create. Relax, receive and be inspired. Last month I gave you the first of four Readings from a workshop on “The Path of Service.” I will continue those in November, but it seemed appropriate to share some answers about death and loss with you this month. Trk 2: The following is from The Opening Reading of Reading No. 3 given at the 2012 Spiritual Retreat called The Path to Personal Healing. The Guides were speaking about the power of thoughts. Within this opening, they give us wonderful information about repopulating your attunements with beloved ones who have made death before you. The Guides mention the name “Anna Marie” She was a much loved Retreatant who had passed on the year before. If you did not know Anna Marie, here you can imagine the soul of our beloved Ron, or your own loved one. Trk 3: The next offering is from the opening of The Guides’ last personal Reading which was given on August 15, 2013:. They address the subject of what is important when completing a human life. Trk 4: In a personal Reading my daughter, Amy, was despairing over the death of her beloved dog. She asked the Guides about how to think about and heal the pain of separation to help her in her grieving. The Guides remind us that this feeling of loss is what humans grapple with over the death of a beloved human as well. "Would elaborate on the relationship between a soul and its human self. You have said that we do not need to worry about dying because we are eternal souls. But, I think you have also said that the human personality self, the personality matrix, is self-aware for a short time after death, and then merges back into the soul. So, really it would seem that the human personality self does end. Would you please clarify this?" Trk 6: This was an answer given in a personal Reading to a dear friend, John, whose beloved brother, with whom he shared spiritual beliefs, had died suddenly. He asked the Guides if his brother’s soul had a message for him. Trk 7: And finally, from the same personal Reading, the closing words are from The Guides to John regarding his brother. The Guides could be speaking to us. We can sense Ron’s presence with us as we listen to these brief, poignant closing words. T3-Question 1: Will you give us a process to help us balance our focus on service to others with service to ourselves? T4-Question 2: Is there a danger in being too kind to ourselves and becoming lazy and/or complacent? If so, how can we know when we’ve crossed the line between the two? T5-Question 3: In giving service to others, there can be a danger of overdoing for them and disempowering them. How can we tell if we’re doing this and are there certain guidelines to avoid it? T6-Question 4: Given that we need to work in areas that most appeal to us, is there an area of dramatic need or where we can have the most impact right now in our evolution? T7-Question 5: How do our daily interactions with friends, family members, even strangers, have an impact on their lives? Is there a process we can use to help us be more aware of this impact, and how can we consciously increase the effect of these types of daily interactions? This Reading was originally Number 12, from December of 1987. I have removed question one which did not apply to December, and replaced it with a question and answer from a personal Reading. T3-Question 1: From a personal Reading: Christians all over the world have accepted the symbol of the cross as an expression of their connection to the Christian faith, or to Christ. And they would say, “Jesus Christ is our savior who died for our sins.” That’s often how it’s put. If Jesus were to design a symbol, choose a symbol for us to remind us of the Christ force now inside of us, what would that be and what would he say that symbol meant? T4-Question 2: We would like to focus again on Christmas now. Would you relate to us the events surrounding the birth of Jesus as they actually happened? T5-Question 3: I am not quite ready to leave the description and the feeling of Jesus and his birth as you have been talking about it. So could you talk a little bit more about the symbolism of some of the stories we have carried forward for two thousand years to help us to have the feeling of inspiration from Jesus's life, for example, the Star of Bethlehem. T6-Question 4: Some people believe that there will be a Second Coming of Christ. Would we expect anything of this magnitude to happen again or was the opening made at that particular time of Jesus's birth? T7-Question 5: In closing could you give us an attunement that we can use during the coming month to help us to awaken in our own hearts to experience the Christ energy at this time?